Do I Cook Ribs Before Putting Them on the Grill? Liquid smoke gives ribs cooled indoors a savory smoky flavor. 4 Do I Cook Ribs Before Putting Them on the Grill? A sad fact of life as a home cook is that you can't always use your outdoor grill. Sometimes it rains, or your city might have a burn ban in effect because of dryness. 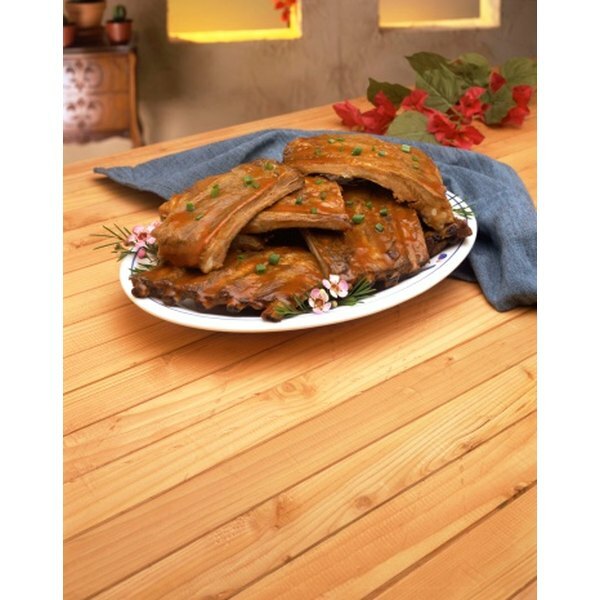 In any case, you can make your ribs taste just as smoky and flavorful inside using your conventional oven as you can outside on your grill. All you need is a secret ingredient called liquid smoke. Liquid smoke is made from the smoke of burning logs that is then condensed and added to water, and it can add the essence of the outdoor grill to your ribs. Remove the silvery membrane on the bone-side of the ribs with a knife. This membrane becomes tough and chewy when it is cooked and it prevents the sauce from soaking into the meat. Rinse the ribs under cool water to remove any traces of blood and pat them dry with paper towels. Sprinkle the rub over the ribs, coating both sides. Mix the liquid smoke and the oil with a wire whisk in a bowl and baste the ribs with the mixture. Place the ribs in a plastic bag and allow them to marinate in the refrigerator for two hours. Preheat the oven to 400 degrees Fahrenheit. 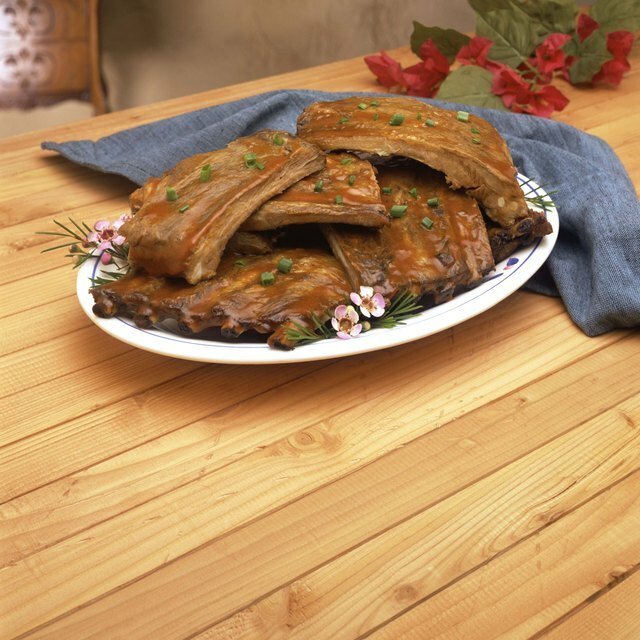 Take the ribs out of the refrigerator and allow them to warm to room temperature, or about 72 degrees Fahrenheit. Take the ribs out of the marinade and place them on the broiler rack. Cook the ribs for 30 minutes, or until the ribs are browned. Take the ribs out of the oven and baste them on both sides with barbecue sauce. Return the ribs to the oven and cook them for 10 more minutes. At the end of the cooking time the sauce should have cooked onto the ribs. Allow the ribs to rest for 10 minutes before you cut them into serving-sized pieces. Serve warm.